Here's a fun exercise. Take a minute. Grab a pen. And write down your first name. Now, did you have to give it a lot of thought or was that an easy thing to do? For most adults, the process of writing anything down on paper is a simple task because the required skills are already embedded in the brain. However, an early learner is just beginning to put together their handwriting toolbox, and an occupational therapist has the resources to help them add the needed tools. Start by preparing the body. Preparing the body is an important component of the handwriting process that often is overlooked. Factors to consider include: current level of alertness, endurance level, strength, posture, and positioning. The learner may sit slumped over, rest their head on a table, and/or lean on their forearms. Each may be signs of tiredness or weak core-strength. To prepare the body, an occupational therapist may use an obstacle course to strengthen the core, shoulders, and hands to improve endurance when participating in handwriting tasks. Sensory play may also be used to increase the alertness level and provide a high energy learner an opportunity to "get the wiggles out". Posture is key. Good positioning and posture must be addressed when seated to complete handwriting work at a tabletop. Ideally, a learner’s feet should be firmly supported on the floor and stability through the shoulder girdle, elbow, and wrist need be present to allow the hand to complete isolated movements. Poor stability within the shoulder girdle often contributes to poor handwriting legibility. A learner’s posture and/or positioning may also be impacted by the presence of primitive reflexes. The occupational therapist may include various upper body weight bearing tasks to improve stability or incorporate additional activities to address these issues. Learning through shaving cream. 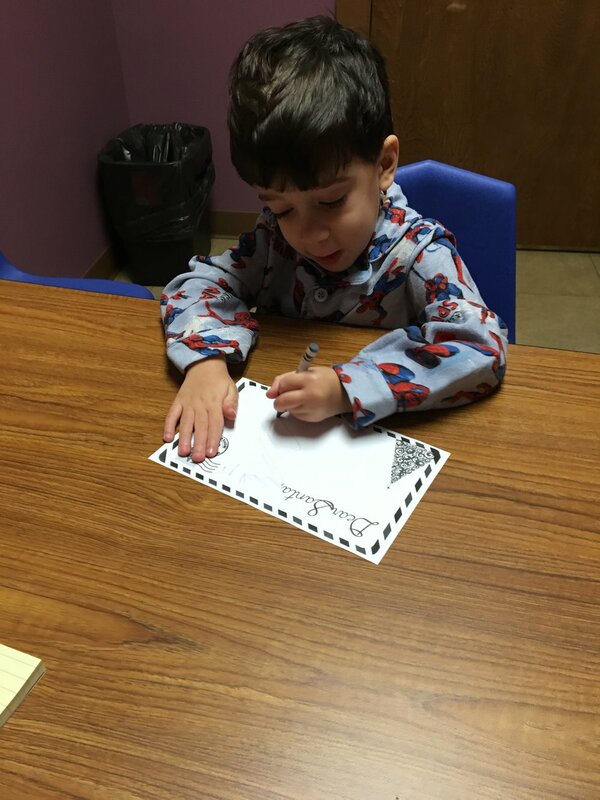 Early learners begin the handwriting process through forming pictures. 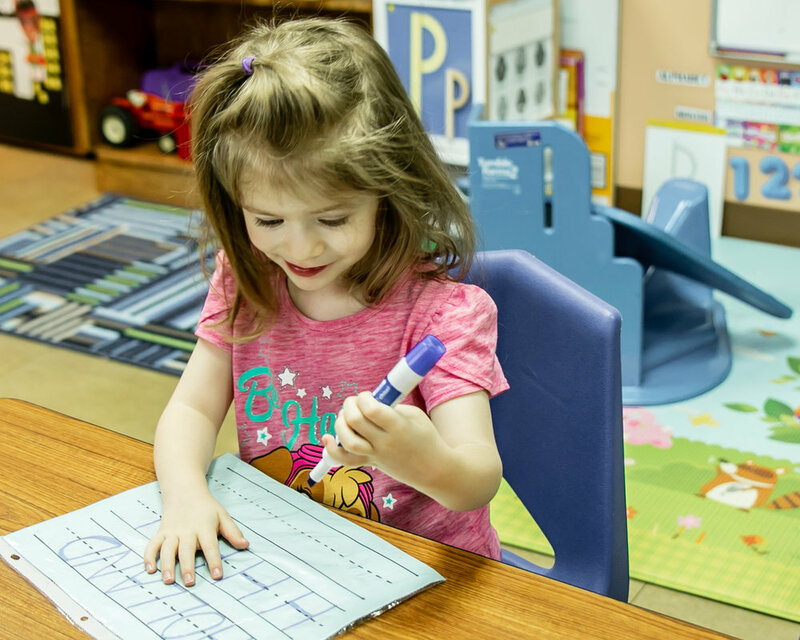 Given a writing tool, early learners will sequentially progress by scribbling, imitating lines, copying lines, copying geometric forms (circle, square, cross, diagonal lines), copying letters of first name in uppercase, and finally copying letters of first name in proper letter case. This progression of learning is often paired with kinesthetic learning to train the brain to feel the correct formation to avoid reliance on visual checking. Occupational therapists frequently use materials beyond paper and pencil to teach early learners to form lines, geometric forms, and upper/lowercase letters. Some of these out of the box materials include: dot markers, play-doh, resistive theraputty, wikisticks, and shaving cream. Purposeful fun. Visual motor activities are commonly used to assist early learners with development of stroke sequences in handwriting. An occupational therapist may include mazes, dot-to-dots, and tracing activities into a learner’s home program. In doing so, an early learner is able to develop the muscles in the dominant hand and to improve their anticipation of directional shifts in letters, helping them to form letters with greater dexterity. Getting started. Early learners begin holding writing tools in inefficient ways. As hand creases and muscles continue to emerge, learners are able to grasp a writing tool with greater control and precision. A learner begins by holding the majority of a writing tool within the palm of a fisted hand. As the hand is fisted, the learner is capable of scribbling with limited motor control, and the arm moves as a unit from the shoulder. Developing the skill. Next, as the learner gains more strength within the dominant hand, the writing tool starts to move away from the palm and is then grasped by extended fingers. The learner will continue to use full arm movements. Then, as the intrinsic muscles of the dominant hand become more independent from the larger muscles of the arm, the learner is able to control the writing tool with combined wrist and finger movements. Gaining control. Finally, as the learner gains full control, coordination, strength, and ability to isolate finger movements of dominant hand, a functional mature grasp is achieved. Occupational therapists guide the development of grasp patterns through use of hand strengthening activities and working on a range of surfaces to encourage hand, wrist, and forearm positional shifts. Low-tech materials. Various low-tech materials may be used to foster a learner’s handwriting development. Materials include specialty handwriting paper, pencil grips, specialty pencils, and writing tools. These low-tech tools bring the learner’s attention to various aspects of handwriting process including but not limited to grasp pattern, letter sizing, and letter alignment. Talk with an occupational therapist for recommendations of tools to foster your learner’s handwriting development. National program locally available. Members of the Special Kids occupational therapy team are trained in the nationally recognized Handwriting Without Tears (HWT) program. By integrating the use of HWT materials in therapy sessions, our skilled occupational therapists guide learners to form pre-writing shapes, to assist in recognition/identification of uppercase and lowercase letters, and begin the stages of appropriate stroke sequence (formation) of capital letters through tracing, imitating, and copying using multi-sensory materials. In fostering further word and sentence development, our occupational therapists provide strategies and support to guide learners to self-edit handwriting in the areas of letter sizing, alignment, and spacing. Opportunities for learners are available in group and one-on-one sessions. References are for informational purposes only and they are not intended to replace physician and/or occupational therapy treatment(s).